Mike Bell is an American artist whose pieces feature a vibrant and distinctive take on popular culture. Born in Atlantic City in 1960, he studied at The College of New Jersey – Majoring in Advertising Design with a Minor in Illustration. Several years ago – after 25 years working in advertising – Bell decided to leave his full-time job and to focus his energy on art. Inspired by punk rock, classic monsters, sci-fi, vintage toys and Japanese cartoons, the artist creates his paintings blending the aura nostalgia and humor. His colorful, multihued and striking canvases often feature characters such as monsters, vampires, iconic celebrities and comic book figures. The juxtaposition of counterculture subjects combined with modern day situations and elements are the blueprint for his artworks. The outcome is a body of work in the pop surrealism genre. Mike Bell has been featured in many publications including Creep Machine, Trend Hunter Magazine, The Sun, and others. 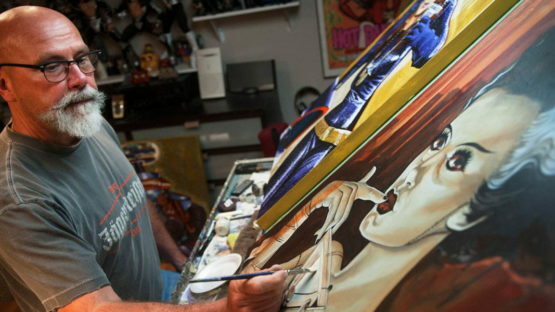 He has participated in numerous exhibitions in galleries throughout the United States and beyond including Lime Light Gallery, New York; Toy Room Gallery, San Francisco; DVA Gallery, Chicago; The Parlor Gallery, Asbury Park; Metropolis Gallery, Pennsylvania; Discovery Galleries, and Bethesda Kustom Kulture Gallery, New York, to name a few. Mike Bell lives and works in Northfield, New Jersey.